These two hikes together as one will give you a nice little stroll just over a mile. First is Knuckup Hill, an old ski hill abandoned in the 1980’s. Starting from the Building Inspectors office building off of Taunton Street you first follow the fire road to the right of the building up the hill. The road winds up the hill and can be steep at times (especially during icy conditions). Soon you will see the remains of a ski lift tower on the right. Take the narrow path here and follow it to the overlook. On a clear day you will get a nice view of the Boston skyline. There are a few other trails that traverse over the top of the hill. Explore them! You will find the remains of a fireplace that once was part of the ski lodge. There is also a rather large boulder of note and two water towers. After exploring the hill, retrace your steps back to the Building Inspectors Office. Next is Trout Pond. To the left of the building is another fire road that leads down to the pond. There is a short loop trail that wraps around the pond. You may notice the white blazes of the Warner Trail here. 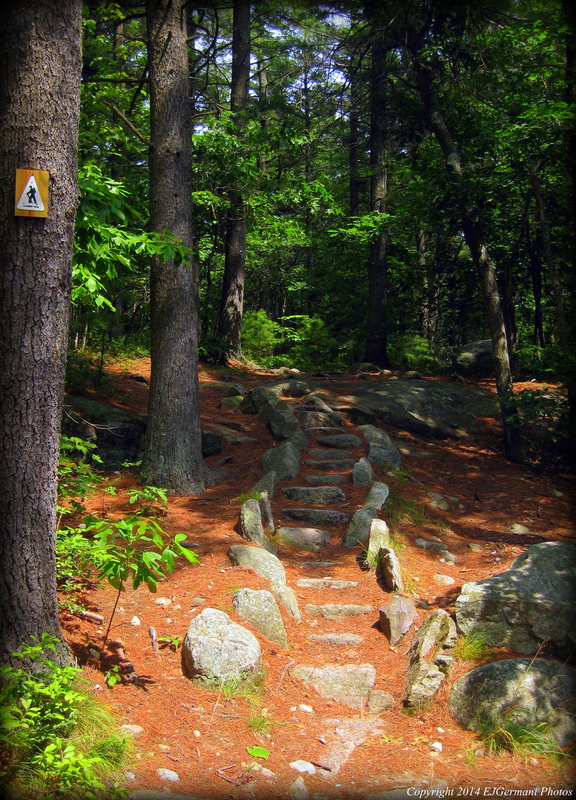 For more information please see the book Easy Walks in Massachusetts. Fairly easy with some elevation and rocky footing in areas. 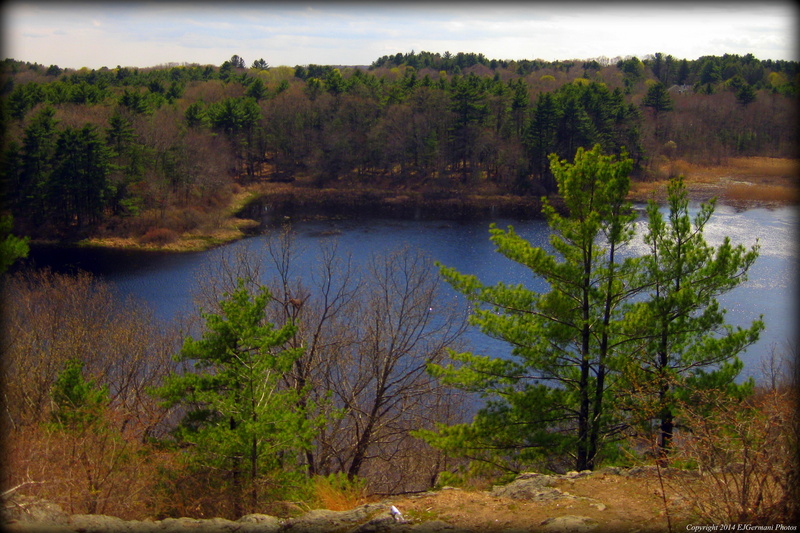 F. Gilbert Hills State Forest straddles the Wrentham/Foxboro line and has miles and miles of trails. Today I was joined by a fellow hiker and we explored the west side of the property. We started from a parking area on Thurston Street in Wrentham just west of the town line. We passed the gate and started heading up the Megley Trail which is a stone covered access road that slowly winds uphill. We came across a few watering holes. Most were dry due to the lack of rain this year. One, however, still had quite a bit of water in it and several lily pads. We also came across some very large rock outcrops along the way. At the end of the Megley Trail we turned left onto High Rock Road for a bit then turned right onto Messenger Road. We soon could see a shelter in the woods. We turned onto a narrow trail that led to the shelter. At the shelter we turned left onto the white dot blazed Warner Trail. The Warner Trail is a 33 mile trail that runs from Diamond Hill in Cumberland to Canton. We then followed the Warner Trail to High Rock. At the top of High Rock there is the remains of a survey disk. From High Rock we made our way down some stairs to the road. There is a a very tall radio tower here. We turned left onto the road toward the gate. Just to the right of the gate the white dot blazed Warner Trail continues. 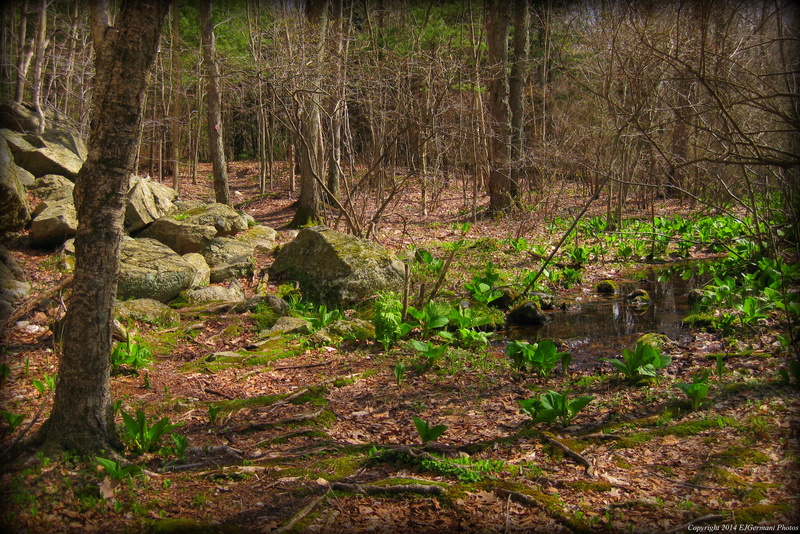 This section of the hike meanders through areas of rather impressive ledges. We continued following the Warner Trail until we reached the blue blazed Acorn Trail. Here we turned left following the trail that is mostly downhill and rather rocky. At the end of the Acorn Trail we turned right back onto the Megley Trail and retraced our steps back to the parking area. We came across a chipmunk and some dragonflies on this hike. Trail Map can be found at: F. Gilbert Hills West. Easy with some slight elevation and some rocky footing. After a short hike at Joe’s Rock we decided to cross the street for hike number two of the afternoon. Birchwold Farm is almost directly across the street from Joe’s Rock. Be cautious when crossing the street here. It is heavily traveled and traffic flows quite fast. After crossing the parking area for Birchwold we came to an sign with a trail map and explanations of the trail markers. There are no specifically blazed trails here, however they are marked with colored arrows. The blue/green arrows lead you further away from the parking area whereas the red/orange arrows lead you back to the parking area. From the trailhead we followed a trail slightly downhill into a large meadow. We came across the first of a few informational signs in this stretch. At the meadow we followed the path to the left and followed it along the meadow before it slowly went back into the woods. At the next intersection we went left crossing a bridge over a stream and area of swamp. The swamp marigold was in full bloom here. After crossing the bridge we went right passing some boulders and a small ledge. We continued following this trail straight pass the power to another ledge formation. Shortly after the ledge we took a narrow path to the left up and around the ledge back to the power lines. We continued straight following a path that would soon come to an intersection marked with an orange arrow. We turned left here following a trail that went up and down over some rock formations before returning to the bridge. There was plenty of birds singing in this stretch. From the bridge we retraced our steps back to the trailhead. There are additional trails here. This hike could easily be made a bit longer if you choose to.